The 1910s in painting saw the rise of the “crowded canvas”, as a post-cubist vernacular swept across Europe. Picasso and Braque had lifted the choppy brushstroke and earthy palette of Cézanne to re-configure notions of forms in spaces; and every artist and their cousin seemed to borrow their angularity and their planar colour-as-form approach, in pursuit of more benignly decorative outcomes, or, alternatively, having looked at the Fauves, began packing in gestural marks and ricocheted incidents rendered in simplistic, “emotional” colour. How often does the vernacular of an approach seem to be the essential quality that gets noticed, championed and ultimately used in subsequent art? At the same time as so many younger artists were working out of cubism, some of the great artists of the late nineteenth century were either entering their old age or nearing the end of their lives: it must have been an intriguing artistic landscape to be alive in. These were the last years of Edgar Degas: a difficult character, by all accounts, who espoused some decidedly shady views (an all-too-contemporary mixture of misogyny and antisemitism) but one who must nevertheless be recognised as an artist of significance and influence…yet how he has been of influence needs further consideration. Degas was a wonderful artist, true: but I have never been fully convinced that he was a great painter. There is often something technically lacking in his handling of oil paint, and his work can often look meagre in terms of its colour intensity: the paint feels slightly undercooked. Furthermore, the image seems to dominate: the paintings look too derived from photographs (even on occasions when they are not), and feel “monocular” in their visual weighting. His earliest ambition, in fact, was to become a history painter; in short, a painter of scene and narrative. Narrative compels an artist to work in the service of the subject matter, rather than meeting the fuller demands of the painting as a painting. I believe this ambition sets him at odds with what I consider to be the truth of painting: that it must be autonomous, and carry its content through its means, and not tangentially, by directing us away from these means to external and extrinsic phenomena. This holds true for all painting – both the figurative (which is about believability rather than illusory “realism”) and the abstract, which, if employed as a portal to other states or issues, only leads us back into the world of figuration anyway. Paintings need not try to evoke. In early middle age, with his eyesight already failing, he moved ever deeper into pastel, sculpture, print and photography. The directness of pastel as a medium, in particular, now suited him far better: it allowed him to stay in constant contact with the surface of the image, whilst holding its colour throughout each gesture; whereas paint has to be applied with greater strategy. Paint is not as responsive to the drawn line, as it literally runs out and needs topping up; whereas a pastel line keeps going. Pastel can be applied effectively over extended time periods, whereas paint can end up like sludge if subjected to the same approach. It needs to dry, be scraped back, and reworked, in order to arrive at the same freshness that a drawing can evince almost by default. Ingres – never the most painterly of artists – famously advised Degas to “Draw lines, young man, and still more lines, both from life and from memory, and you will become a good artist.” He clearly never forgot this encounter, as his development as a draughtsman was remarkable: his grasp of form- in particular, the human form- is the ‘spine’ that runs through his life’s work. Ironically, however, it was this very response to form that I believe stopped him from advancing his colour. Colour clothes form, as the saying goes, thereby preventing it from fulfilling its illusory connection with our perception of three dimensions; and conversely, when colour seeks to go off on its wild adventures, tone is often used to regain the articulation of form. 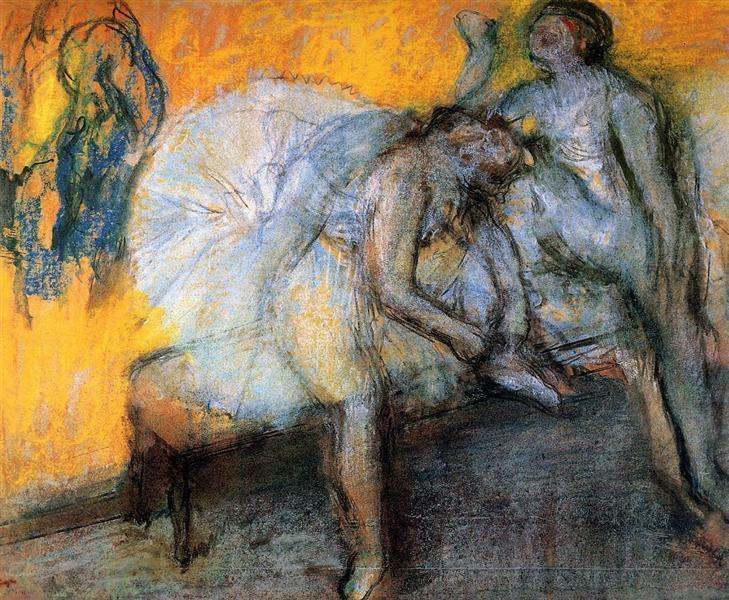 In Two Dancers, there is a terrific insouciance of handling: it looks as if Degas couldn’t care less. We are presented with a yellow wall- or is it a mirror?- one can’t be sure, because the frenzied blue suggestion of what looks like a figure of sorts floats in the top left corner; perhaps a third dancer? The yellow blazes above the ballerina tying her laces, and the shadows under the bench appear like charring on a sodden-looking floor. The picture offers a narrative of ghost-like forms lurching in the depths of some macabre burned-out theatre. The right-hand figure is agonizingly posed, and seems drained of colour, its life and anatomical certainty dissolving in bluish green. The image becomes ever more grotesque and compelling as we look at it; yet in spite of its hallucinatory intensity, we are returned to the world of form with a thud; the black outlines weight the figures, delineating and drawing them back from the spectral into the everyday: the blue scrawled figure is now nothing more than an echo of the harrowing journey. Degas used colour remarkably expressively, and made some beautiful statements in pastels; yet in spite of their fulgence, they feel like coloured drawings, rather than works that possess the essential plasticity of a painting: he was, as he himself observed, “a colourist with line.” In these -admittedly highly seductive- pastels, the light is local rather than synthetic, and the colour is serving the form: in theoretical terms, it is orientating itself against the vertical axis of tone rather than moving through the spiralling orbits of hue. I must say that even though I do not hold Degas the painter in as high esteem as, say, Manet, I think he was the greater draughtsman of the two; and I still gorge on those pastels, which are like cream cakes for the eyes – a delicious treat. That some of his drawings stand up to anything that came out of the renaissance was an opinion, I believe, that John Berger held. I wouldn’t contradict that view.